I remember the day we first landed in South East Asia and took the bus from Phuket to Krabi, Thailand. From there we had to take a songthaew (local transportation) into Krabi Town where we had fore-planned on staying for a while. It was so awkward stuffing our 2 gigantic suitcases in the back as they alone were occupying at least 4 seating areas themselves, not even including the 2 stuffed carry on bags we had with us. This meant we had brought along all kinds of luxuries we thought we could not live without. For me this was computer supplies, like a big fancy modem, hard drives, cords, etc. For Regina… well she brought half of her baking supplies along. A long story short and many beach visits later, we started to get restless and were ready to move on after only 8 months in Krabi Town. Our next destination was Penang, Malaysia. We had scouted Penang out on one of our visa runs and decided it would be a great place to settle down for a bit. We booked a minivan ticket from Krabi town and got up super early to catch it. They came by to pick us up, but when they saw our gigantic suitcases, they refused to take us. This was extremely frustrating. So we had to go get a refund from that company and then book with another company. This time we paid for 4 seats just to make sure they would take us. Looking back, this all turned out for the better because we ended up with a much nicer van than we would have gotten in the first place… oh and, we got the entire back-seat to ourselves. That alone was worth the extra $30 USD we paid for that 4 hour journey. As soon as we got to the border, it meant we had to drag our luggage up a few sets of stairs to put it through a luggage scanner. And this is where I first became comfortable with border officers… probably as a direct result of me having to burst out laughing in front of them. Here is what happened: They backed up Regina’s suitcase a time or two (in the scanner) just to get a second look at it. The officer asks her to step aside and open the overflowing suitcase. So she did. Once opened, he starts going through it, taking things out – one at a time. He pulls out Regina’s precision scale. She used it to measure ingredients to a milligram. I suppose a super handy resource if you are a professional baker (or a cocaine breaker). The officer looked it over and over and finally puts it down. I thought it was kind of awkward, until he pulls out a bag of powdered/icing sugar. In case you did not know, it is white and powdery like flour (or cocaine). This is where I started to connect the dots and realized they had seen the bag of white powder in the suitcase, and then decided to check it out – probably thinking it COULD be a narcotic (for the record: smuggling drugs into Malaysia warrants the death penalty – it’s a very serious crime if caught). Hence his utmost curiosity when he stumbled across the precision scale. At this point I could not help myself and burst out laughing out loud. The officer quickly realized that this was an honest misunderstanding and wished us a good day. Phew! 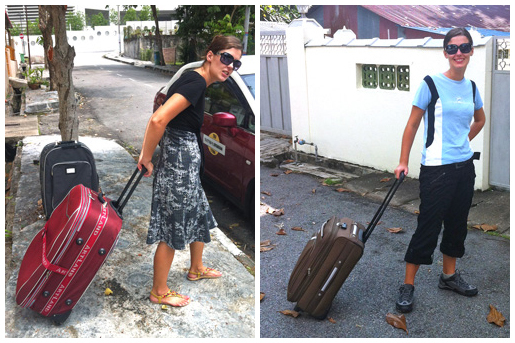 It very quickly became evident that the most frustrating part about “moving” for us was our luggage. This is when we decided to throw out what we didn’t use (like extra pairs of shoes, worn out clothes, etc) or donate what was still in good condition to a local charity in Penang. As Regina noted here, we downsized from HUGE suitcases plus carry-on duffel bags to one small carry-on suitcase each. It has been interesting journey ever since! We barely buy anything we can’t consume, and if we do, we carefully decide before hand what we will sacrifice in it’s place. After all, there is only so much room in a small carry on. It might sound limiting, but it is freeing in every sense of the word. I would have never understood this when we first started traveling 2 years ago, but I would not trade it for the world. Carry-on only has become our preferred way of traveling! 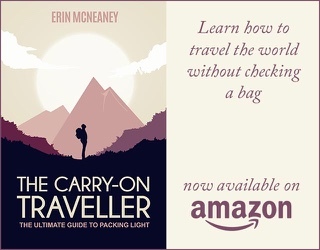 If you are curious to learn all the tips and tricks you’ll need to know for packing light and traveling with just carry-on luggage you need to check out The Carry-On Traveler (written by Erin McNeaney of the Never Ending Voyage blog). Here is a short speech from the movie “Up in the Air” that forever haunted me when I first watched it a few years ago. I could have never imagined living with a similar philosophy back then – yet here I am. HA! Regina I love that you packed your precision scale! Haha, yeah my scale is dear to me. We sent it home when we ‘downsized’ but I still miss it every time I am making some sort of treat/dessert. Stopped by to welcome you to Collective Bias! You gave me such a laugh and so much to think about at the same time. I watched the video and have not seen the movie before but would love to see it now. The difference between the two pictures and the body language says it all. Enjoy your travels. Aww…thanks so much for stopping by here Wendy! I really appreciate your very warm welcome. It is such a good movie actually. I loved it. Traveling light is the best part of your travel. One can enjoy a lot if he could avoid a large suitcase or bag. I am glad to read that you donate some goods to local society instead of throwing them. This was nice. Your post is full of particle experience. Thanks for writing it. Great blog guys 🙂 Love this entry – it’s so true that when you first leave to travel long-term EVERYONE always over-packs! If it makes you feel any better, I still haven’t learnt my lesson :O I always send stuff back home a couple months into the trip!